Pop. Fizz. Clink! 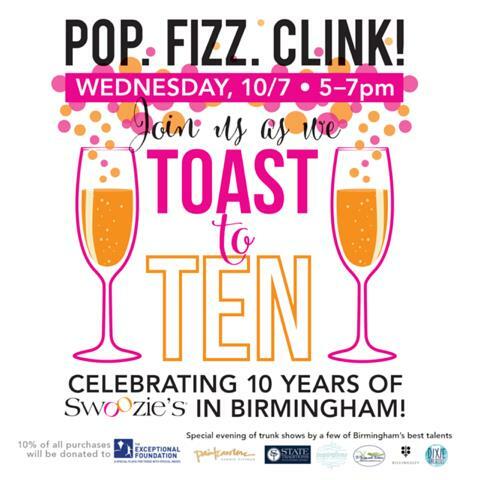 Swoozie’s at The Summit is celebrating ten years of business in Birmingham on Wednesday, October 7. The Exceptional Foundation and local companies join Swoozie’s at The Summit as they TOAST to TEN with special discounts all day and an over the top soiree from 5pm to 7pm. Customers will receive 10% off throughout the day with an even deeper discount of 20% off from 5 to 7pm. A portion of the day’s sales will benefit The Exceptional Foundation. The first 25 guests to RSVP to swoocrew@swoozies.com will receive a bag full of Swoo. In addition, students who show their college ID during the party will receive an unlimited vinyl personalization pass, $50 printing pass and two free monogramming passes for the month of October. Swoozie’s will be giving away prizes throughout the evening valued at $100 each.